The warmth of summer draws us outdoors to our patios, lawns and yards, but the intense summer sun can make it unbearable to enjoy an otherwise perfect day. To shield barbecues, hammocks and play areas from the dangerous rays of intense sunlight, many homeowners decide to install canvas awnings on their homes. These awnings will shade the area beneath, cutting back on sunburns and heat sickness while still allowing you to enjoy the outdoors. Measure to the height on your wall where you want to install the awning. 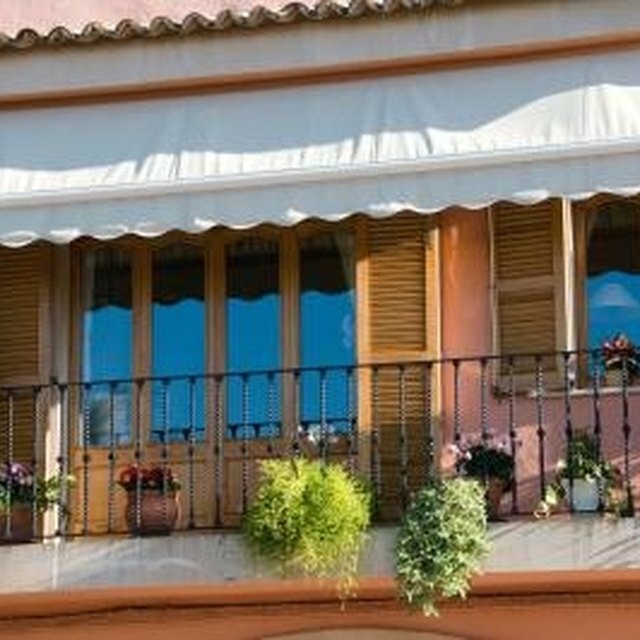 This will vary with the size of the awning you have chosen and your own particular needs. When you have the appropriate height, mark the location with a chalk line snapped across the wall. Use a stud finder to locate the studs along the chalk line. Mark each edge of each stud with its own chalk mark. Then snap a chalk line vertically to mark the center of each stud. Line up the awning's first installation bracket at the furthest length of your wall, where the first center stud line intersects your original horizontal height line. Install the bracket using the provided screws and a screwdriver or drill. If you are drilling through concrete or brick, be sure to use a masonry drill bit. Attach all brackets and fasteners following manufacturer's instructions regarding spacing. With all support structures in place, slide the awning bar into the mounting brackets and secure it in place following specific instructions. Carefully and slowly pull the awning out to test and make sure it will hold before allowing anyone to stand underneath. Seal all fastener holes in the exterior walls with exterior grade caulk to prevent rainwater from leaking in. Every awning is different; you will have a different number of brackets, type of screws and other details. Follow specific manufacturer's instructions for these details. Can You Attach an Iron Headboard to a Standard Bed Frame?